Europe oil filled distribution transformer market size will exceed USD 1.4 Billion by 2024, as reported in the latest study by Global Market Insights, Inc. Rising public and private investments toward the expansion and upgradation of grid infrastructure with an aim to establish a reliable and affordable electric supply network will augment the Europe oil filled distribution transformer market. In addition, rapid technological enhancements favored by stringent energy efficiency norms across the region will further augment the product demand. For instance, ENTSO-E in 2016, under its ten-year network development plan allocated funds over USD 150 Billion towards the expansion & upgradation of T&D networks across the region. 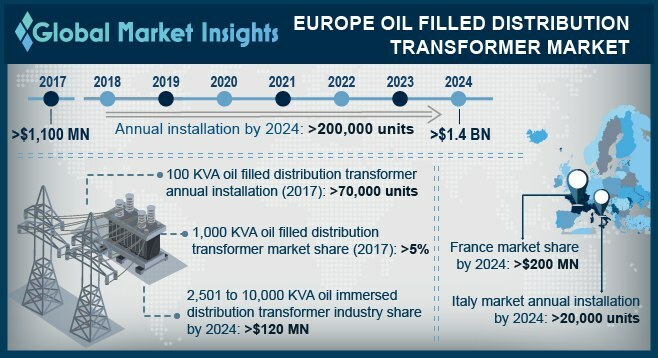 Italy oil immersed distribution transformer market is anticipated to exceed an annual installation of 20 ‘000 units by 2024. The National Energy Strategy has laid down medium and long term regulatory objectives to reduce energy costs, strengthen security of energy supply, meet environmental targets, and propel sustainable economic growth. Henceforth, ongoing regulatory prospects across the nation lay favorable grounds for the expansion of effective energy networks which in turn proliferate the industry landscape. 1,000 KVA in 2017, held over 5% of the Europe oil filled distribution transformer market share. The product is projected to witness sustainable growth on account of increasing demand for compact transformer units. Increasing deployment of privately owned substations to sustain the rising energy demand across commercial establishments and manufacturing units will further drive the industry size. The deployment of smart grid technologies has been a state-driven phenomenon across the region. Countries having higher income, sustainable population, and higher electricity consumption drive the expansion of smart grid networks. The rapid adoption of smart electric components favors the acceptance of evolving smart distribution transformer technologies across the states. Henceforth, the rising demand for a sustainable and reliable electricity network across the region will stimulate the oil immersed distribution transformer market. Renewable energy in the recent years has gained significant proliferation across the globe which has in turn augmented the industry growth across the European sub-continent. Growing concerns toward GHG emissions coupled with stringent energy efficiency norms across the region have constituted a favorable business platform. Thereby, positive outlook towards renewable integration favored by regulatory inclination to establish sustainable energy mix will drive the oil immersed distribution transformer market growth. 2,501 to 10,000 KVA oil immersed distribution transformer market is set to surpass USD 120 Million by 2024. These products find high applicability across long range distribution networks including grid-isolated and rural areas. Rising energy demand across these regions will boost the product penetration. Industrial apprehension and expanding commercial establishments across the region will augment the 630 KVA oil filled distribution transformer market growth. The technology subject to large scale industrial investments to sustain the rising demand for manufactured products is set to witness comprehensive growth. Notable participants in the Europe oil filled distribution transformer market include, Ruhstrat, SGB-SMIT, Imefy, Hyundai, Celme, Eaton, General Electric, Siemens, Toshiba, Schneider, Hyosung, Mitsubishi, Crompton Greaves, ABB.